Offer Terms: New players only, first deposit only. Min deposit of £10. Kaching tickets x 60 credited automatically. The Big Bang tickets x 4 & 10 free spins credited within 24 hrs excl.Saturday. Free spin wins capped at £1 cash, no wagering on winnings, further terms apply. Bright Bingo is exactly what it says on the tin. It’s bright, sparky and bursting with character. 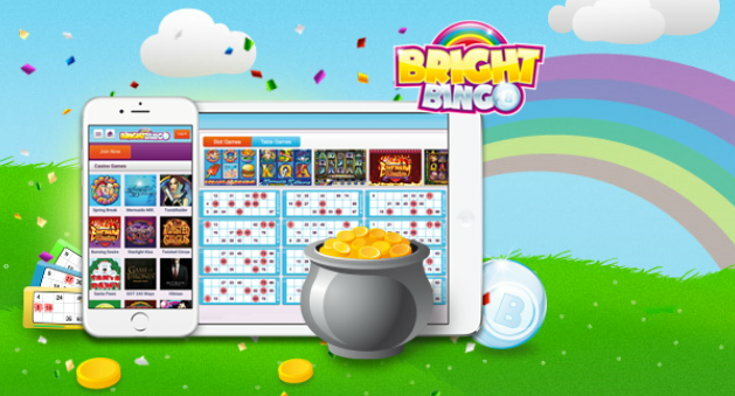 Originating in 2014, Bright Bingo is one of the newest sites around. Originally running on B-Livegaming software the site migrated to the Dragonfish network in 2018 to offer players a more encmpasing gaming experience. This software has a more personal feel compared to competitors. It’s colourful and fun, with HD graphics and an enticing theme. At Bright Bingo, the main focus is its players. There is a huge light shone on the community side of gaming. With its advanced software, players can use webcams in the chat rooms and meet fellow daubers. This is a feauture completely unique to Bright Bingo. There is also fantastic loyalty program as the team at Bright Bingo like to reward its players, aka “Bright Sparks”. Earn XP points throughout your play for brilliant bonuses, and surprise treats. At Bright Bingo there are many varieties of 75 and 90-ball bingo across several different themed rooms, and you will also find a great selection of popular slots and casino games too. The motto at Bright Bingo is to “Reward its real players”, and the new player bonus is one of the best around. Simply click the link at the top of the page to see all the welcome offer details. Terms and conditions apply and all players must be 18 or over to be eligible. Other bonuses and promotions come in the form of the Bright Sparks Loyalty Scheme. There are 10 rainbow levels to work your way through and the more XP points you gain, the more bonuses you’ll earn. These come as either free bingo, regular re-deposit bonuses, big cash jackpots and free slots spins. 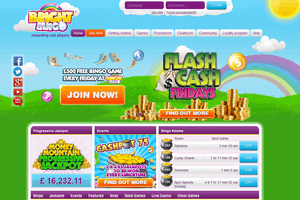 Bright Bingo operates on the Dragonfish network and the brand is registered to Dazzletag Entertainment Ltd. The platform offers a variety of both 75 and 90-ball bingo games, and players can also get involved in the special Bright Bingo chat room games too. These are played in addition to normal bingo and offer players the chance to win exclusive prizes. There are 6 different chat games available. The Bouncing Bonus, Run For The Money, Lucky Pair, Blackjack, Quack Quack and Three Of A Kind. All games are extremely fast paced and have lots of exciting bingo bonuses up for grabs each day! Players qualify for chat bingo games when 4 or more tickets are bought from the balance meter. Bright Bingo also offer a fantastic progressive jackpot called the Mountain Progressive. It runs across all standard rooms and is currently approaching a whopping £14K. Alongside its fantastic bingo, Bright Bingo also offer a nice selection of slots and casino games too. Each slot has a demo option so players can trial out each game first to get a good sense of the different themes and prizes on offer! Slots titles include Immortal Romance, Bridesmaids, Jurassic Park and Go Bananas. Players will also find a great selection of table games and live casino too! Have a go at some Blackjack and Poker if you fancy something a bit different to bingo and slots. There’s not a huge selection, but the options are all of a really great standard. Please read all terms and wagering requirements upon registration, as details are subject to change. Bingo wagering requirement is 4x bingo bonus. For one of the newer sites on the market, Bright Bingo still really packs a punch. The bingo is classic, yet with its exclusive chat room games and webcam options, players are offered something entirely different and completely unique. The loyalty scheme means that bonuses are in abundance and there’s always something on offer for players both new and old. If you’re after a site that holds a strong focus on community, rewarding its own “Bright Sparks”, then Bright Bingo might well be worth a try.